Power has been restored to thousands of homes left without electricity in the north of Scotland by extreme weather. Scottish Hydro Electric said the number of homes without supplies had been reduced from 8,000 to 2,000. Meanwhile, the A9 has fully reopened after sections of the road were closed by the effects of the weather and the discovery of four unexploded bombs. The devices were safely detonated after being unearthed by severe flooding at the Catalina Junction near Alness. First ScotRail said there were still no rail services north of Inverness. The response to the floods has been criticised by some politicians, including John Farquhar Munro, MSP for Ross, Skye and Inverness West, who said he wanted to see more help for flooded communities. However, police have defended the action taken by emergency services and agencies tasked to dealing with what was described by Northern Constabulary as a major incident. The full length of the A9 reopened on Friday. A bomb disposal team had been called to deal with the bombs which were unearthed on a river bank. They were detonated in two controlled explosions. Catalina Junction is close to the site of a former World War II sea plane base. The clean-up operation follows flooding and winds which reached 90mph in some areas, with fallen trees blocking dozens of roads in the Highlands. A number of schools remained closed in the area on Friday. 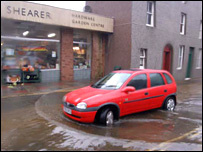 The heavy downfall also caused flooding and disruption in areas of the Northern Isles, including Kirkwall. Since the incident began Northern Constabulary said it had dealt with 338 incidents and taken more than 5,000 calls from the public. Emergency planners meet to discuss how to deal with the situation in Easter Ross, Caithness and Sutherland. Electricity companies said the extensive flooding and strong winds had made it difficult to restore energy supplies. Scottish Hydro Electric said: "We've been working round the clock to restore as many homes as possible and will carry on through the night. "There are still small pockets that are without power." Hundreds of extra engineers have been drafted in to help local staff restore supplies. A spokesmen said anyone finding an overhead power line which had been blown down should call its emergency line on 0800 300 999 and keep clear because the cable could still be live. 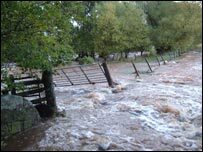 Live flood warning information is available from the Scottish Environment Protection Agency (Sepa) on 0845 988 1188. Meanwhile, police said they had been made aware of a number of abandoned vehicles between the Dornoch Bridge and the Mound. They are asking the owners to bring their vehicle's keys to Dornoch Police Station or telephone 01862 810222.